Many fashionable women look forward to summer, it's time for bright experiments with his looks. But fashion is changeable and capricious, and should be treated with caution for such jewelry, such as tattooIruka because you apply a permanent drawing on your body. But for ardent lovers of experiments on themselves, there is the alternative of a temporary tattoo. She looks very seductive, and the duration of its life is only one month. If you have some skills in art, then you can apply it as a tattoo at home. Put the henna powder in a container, dilute it with warm water and add lemon juice. Mix thus, to make a thick slurry. The larger the figure, the more the henna plant. Do it thirty minutes prior to the procedure. Treat the spot tattoo eucalyptus oil to get the best color. Draw a picture with marker on some tape, then attach it to the skin. You should get a print. The imprint of the circle brush, as needed, dipping the brush in the bowl with the henna. This procedure better repeat twice. 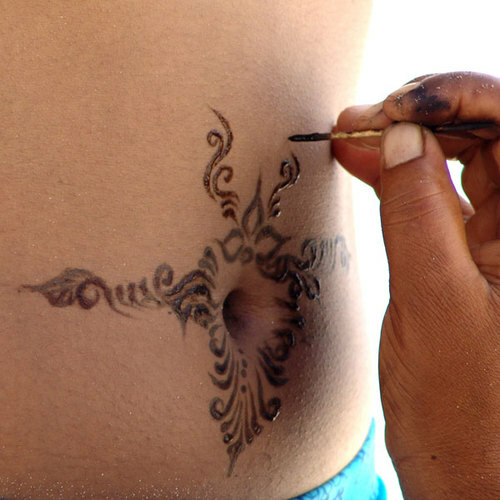 After that, with the aim of obtaining the desired intensity of color henna tattoo waiting for about an hour.